Balloon Bulbs | Light Up Balloons at Every Event! Light up 3 ft latex balloons easily! Creates breath-taking balloon décor for weddings, sweet 16, quinceanera, and marketing purposes. 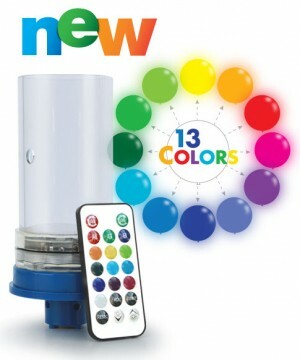 Choose from the NEW LED Balloon Bulb with 13 bright colors or the original Balloon Bulb (white color only). WOW, this item is popular! Trevor from Baton Rouge bought this exact item recently! Balloons Bulbs Light Up Any Party! Designed exclusively for balloon decorators and party planners, these high profile but easy to use Balloon Bulbs are a perfect accent for dance floors, entrance, décor, buffet areas, or any special location indoors or out. Each long-life, low-temp fluorescent Balloon Bulb (8,000 hour) provides the equivalent brightness of a 90 watt incandescent bulb. Balloon Bulbs are great for column toppers or can be suspended from the ceiling to create a spectacular effect. Simply insert the Balloon Bulb inside the neck of any color 36″ Latex Balloon and inflate on the spot using a portable electric Air Inflator like the Air Pro, and you’ll create a jaw-dropping effect! NEW LED BALLOON BULB! Light Up Any Party! Designed exclusively for balloon decorators, Conwin’s Balloon Bulbs are a perfect accent for dance floors, entrance, décor, buffet areas, or any special location indoors or out. Each long-life, low-temp fluorescent Balloon Bulb (8,000 hour) provides the equivalent brightness of a 90 watt incandescent bulb. Balloon Bulbs are great for column toppers or can be suspended from the ceiling to create a spectacular effect. Choose from 13 bright colors to illimuniate your balloons! Conwin’s new LED-Spectrum Balloon Bulbs are cordless, battery operated, and stay bright for over ten hours. Includes a hand held remote to easily switch colors, automatically fade or jump between colors, and increase or decrease the brightness. Great for Advertising at night with Printed 3-ft Latex Balloons too! Imagine being able to capture attention from new customers as they walk up and down the street, looking up to see your company’s name in lights as a Bouncing Billboard! What an effect! Only Balloon Bulbs can produce that cost-effective, branding effect for companies. Create that magical, attention-grabbing effect with these Light Up Balloon Bulbs!